A smooth tissue called articular cartilage, lines the surfaces of the joint hence enabling them to move smoothly & easily. Synovial membrane surrounds the hip joint, which secretes synovial fluid that lubricates the joint. Ligaments & capsule connects the ball to the socket and provide stability to the joint. The damaged bone and cartilage is removed and replaced with prosthetic components. 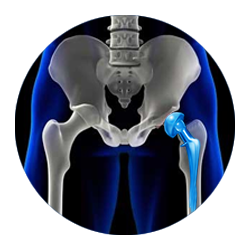 Surgery takes around 1 ½ to 2 hours for hip replacement. The damaged femoral head is removed and replaced with a metal stem. The femoral stem is either cemented or uncemented into the bone. A metal or ceramic ball is placed on the upper part of the stem. The damaged cartilage surface of the socket (acetabulum) is removed and replaced with a metal socket that is secured with screws or cement. It will take 4-6 weeks on an average to get back to normal and walk independently with walker depending on individuals.